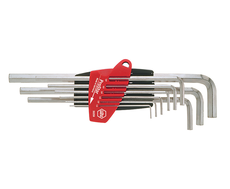 Wiha 9 Piece Prostar Metric Hex Plus Ball-End Hex Key Set, From 1.5mm To 10mm. Chrome-vanadium steel, through hardened, chrome-plated. Space saving ProStar allows the easy removal of each key without moving any others. Come with a full guarantee from Wiha Tools. The space saving ProStar hex key set allows the easy removal of a key without moving the others and can be used on all of those screws that are difficult to access. A ball end design enables the user to work at angles up to 25°. All items purchased from our eBay store come with a Fourteen (14) Day Peace of Mind Return Policy.